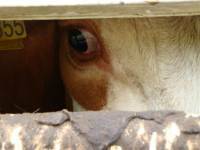 Most people are unaware of the horrors that animals must experience during transport, often long-distance and with no rest or unloading, in all weather conditions, before they are slaughtered at their destination. Upon arrival, animals come out of the trucks frightened, hungry, and thirsty, wounded and with broken limbs. Many just stay there, lying in trucks in their own excrements, often suffocated while others trample upon them in overcrowded trucks, dying of heat or frozen. Croatia does not fulfill all the conditions for animal transport and transit, since it lacks proper resting places for animals and adequate border crossings. And yet, its roads are full of overloaded trucks. Animals sometimes have to wait for ten hours at the border, although they should wait for two hours at most, in exceptional circumstances. The torturing journey of animals that are transported from the European Union can last up to several days. Live animals transport is unnecessary, unethical, and cruel. It should therefore be banned completely. In order to draw public attention to the violation of legal regulations and the cruel reality of animal transport, Animal Friends' activists are organizing a long protest procession, which will start on Saturday, November 6, 2010, from Trg marsala Tita in Zagreb, and reach Trg bana Jelacica at 12 noon. 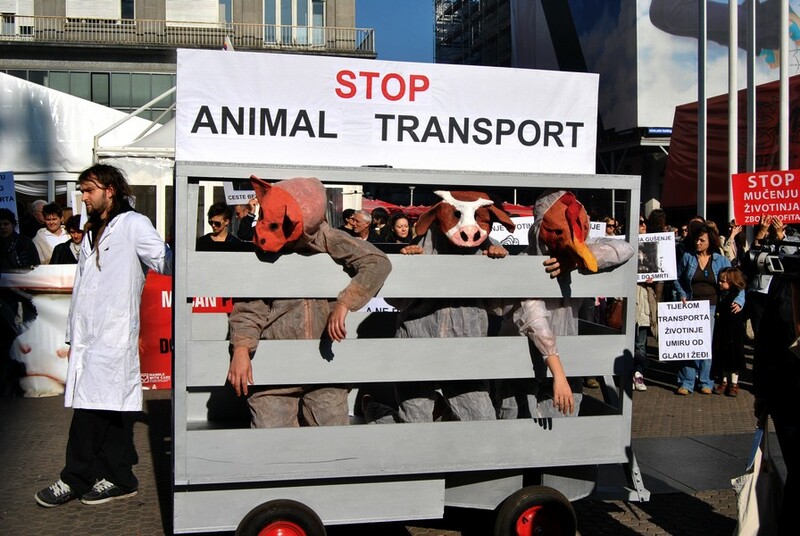 There they will enact a performance in which activists dressed as animals in a transportation vehicle will symbolically present the suffering of animals on the roads of Europe, on their long and painful journey to the slaughterhouse. It is estimated that more than six million animals annually are transported for more than eight hours all over Europe. Such long exposure of animals to the hard transportation conditions results in an exceptionally high level of psychological and physical stress. Its consequences are weakness, exhaustion, wounds, and stress. Therefore, many countries, including Croatia, have introduced laws that regulate the conditions of animal transport to various degrees. However, practice has shown the terrible truth: These legal regulations are often vague in formulations and remain largely inefficient. Animal Friends therefore insists that the European Union and Croatia should immediately enforce the existing legal regulations more strictly. In the first phase, the maximum duration of the transport should be limited to eight hours; in the second phase, animal transport should be banned altogether. Even though the transported animals are to some extent protected by the Croatian laws, in practice these legal regulations are rarely observed. This has been the conclusion of a number of associations and institutions joint in the international campaign "Handle with Care," launched by the World Society for the Protection of Animals (WSPA). It is necessary to achieve further changes in laws and better control over their implementation, as well as raise the public awareness about the fact that by consuming meat and meat products one becomes a commissioner of suffering, and that every person can refuse to participate in that process. Bone fractures, haemorrhages, and hematoma are the most common injuries in birds (it is estimated that there are 95% of multiple bone fractures in broiler chickens), occurring as the consequence of extremely rough handling and cramming animals into small crates or transport cages. Physical and mental stress in pigs is particularly increased due to the fact that pigs suffer from the so-called "motion sickness" (they show a high level of sensitivity to noise, motion, changes in their surroundings, etc. ), which is manifested in increased excretion of saliva, vomiting, diarrhoea, increased body temperature, and apathy. Overloading and other stress factors to which cows are exposed during transportation severely disturb their immune systems. Pneumonia caused by the bovine herpes or the pasteurelle bacteria is especially common during transport. Research has shown that after 24 hours sheep and lambs lose up to 8% of their weight, which is a consequence of frequent waste passing as a reaction to extreme mental stress. Even after long periods of thirst, sheep will often not drink water from an unfamiliar source. Dehydration, suffocation and being trampled to death are common causes of death. Animal Friends emphasizes that the most efficient way in which every person can contribute to the transportation ban is to shift to meatless diet. By making this personal choice of excluding foods of animal origin from one’s menu, one can improve one’s health, protect the environment, and directly diminish the suffering of animals in transport. For additional information and a video on animal transportation "Some Lie Dying," please visit www.youtube.com/afcroatia. To see the photo gallery from the demo please click here.